If you’ve been taking care of a senior relative or friend and are feeling overwhelmed by the responsibility, hiring home care can help provide the senior the level of care he or she needs — and you the relief you deserve. Home care can vary in terms of level of service, so when considering in-home care, first try to take stock of what your loved one’s needs are. Do they need someone with them 24-7 (in addition to the care you’re able to provide) or for just a few hours a day? Maybe they’d prefer the socialization companion care offers — or perhaps their physical and/or mental health demands a mix of help to best cover their needs and yours. 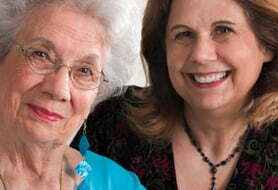 When hiring, there are several types of senior caregivers to consider. These tend to break down into two different categories: non-medical caregivers and medical caregivers. 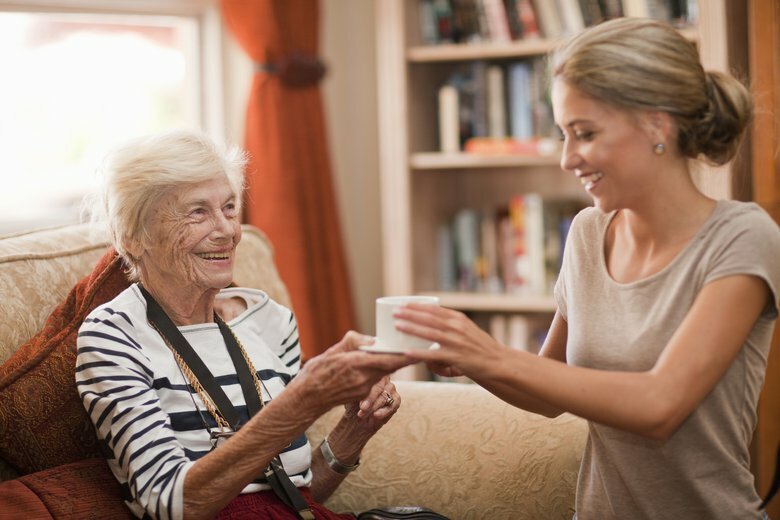 Companion care: This type of care is the least hands-on in that the caregivers are not certified to offer medical assistance but rather are there to provide everyday social interaction and help with light housekeeping and errands. No formal education or licensing is required. 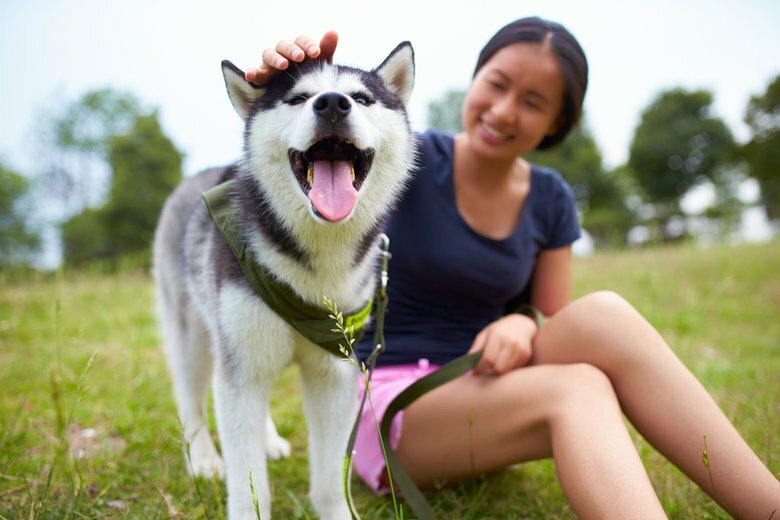 Personal care: This type of care is a level up from companion care in that caregivers can assist with more hands-on tasks such as bathing, dressing and toileting. 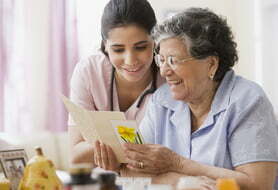 Personal care assistants are often known as certified nursing assistants (CNAs) or home health aides (HHAs). Training and certification vary for both positions by state, but generally speaking, CNAs have more training and may work under the supervision of a registered nurse. In 2018, the national average hourly rate for in-home care when hiring independently was $13.50 - $21.13 (source: care.com). 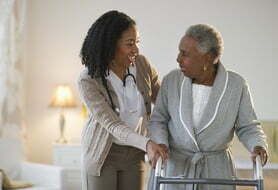 Home health care: This is a specific type of care that follows an injury or illness, and is generally prescribed by a doctor and covered at least partially by Medicare or Medicaid. 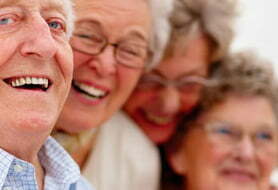 Home health care involves checking vital signs, and monitoring pain and medications. Skilled nursing care: This is the most intensive level of care and may be suitable for seniors recovering from an injury or living with a serious illness such as cancer. Skilled nurses can help with wound care, injections and comprehensive health monitoring. Skilled nurses generally don’t offer companion care services such as cooking and light housekeeping. 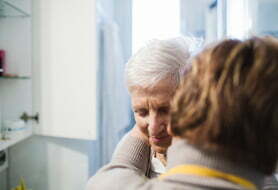 Hospice care: Hospice care is for terminal patients, generally those with six months or fewer to live. Hospice is commonly administered at home or wherever the person is living, and is carried out by a team who can help manage pain, offer counseling and administer medications. What is an aging life care manager — and should you hire one? In-home care: What are your options? 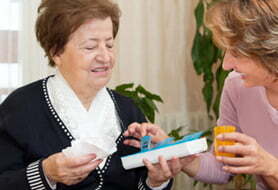 When hiring an in-home caregiver, you’ll first want to determine the type and amount of help you’ll need. 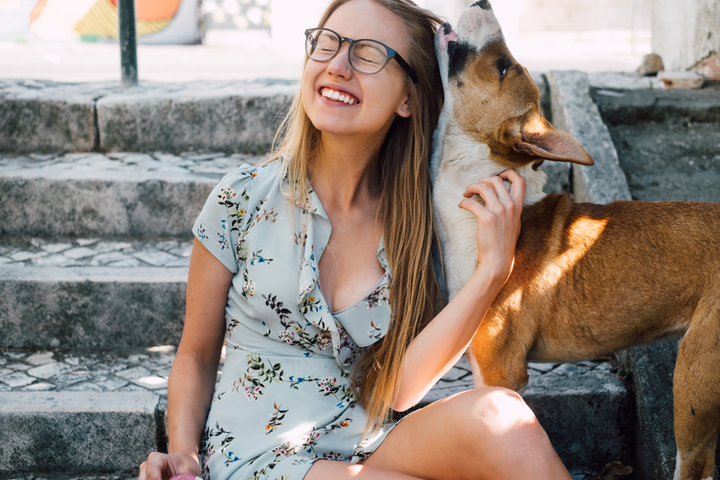 Do you need someone just to help with errands and offer companionship to your loved one, or do you also need someone who can help monitor and administer medications? And do you need someone for a few hours a week or around-the-clock care? Once you have an idea of that, the next big decision you’ll need to make is whether you want to hire independently or go through an agency. There are pros and cons to consider for both. Hiring independently tends to be less expensive but requires more legwork on your end to vet and manage caregivers. If you want to hire independently, you can get recommendations from friends or search on care.com. Conversely, going through an agency offers more coverage, such as when a caregiver is sick, but you are likely less in control of who shows up to care for your loved one. For a full breakdown, make sure to reference our articles on the pros and cons below. When hiring a senior caregiver, you know it’s about more than just finding someone who is capable of the job, but also about who is going to be the right fit for your loved one. When evaluating candidates, ask about and look for the following to find the person who will not only look out for your family member, but will truly care for them too. Personality. Does it seem like they would get along with the person needing care? Hobbies and interests. Do they have things in common with the person needing care? What they’ll spend their time doing. Will the worker take the person for walks if they’re able to or watch TV? How they handle difficult situations. Think about a time that caring for the person needing help was difficult. 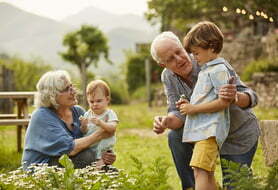 For example, was there a time when your parent fell and you had trouble moving them? Has your loved one with dementia ever wandered off? How would the caregiver handle that scenario? References. Ask previous employers about the person’s competence, reliability, compassion, and bedside manner. Hiring a caregiver can sometimes feel like a less formal arrangement since the person is working in your home instead of in an office setting. But it is still a professional agreement that will work best when treated as such. 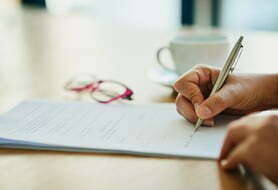 An important step to take to cement this arrangement is drafting and agreeing upon a contract that both parties can sign and have to reference throughout the working relationship. 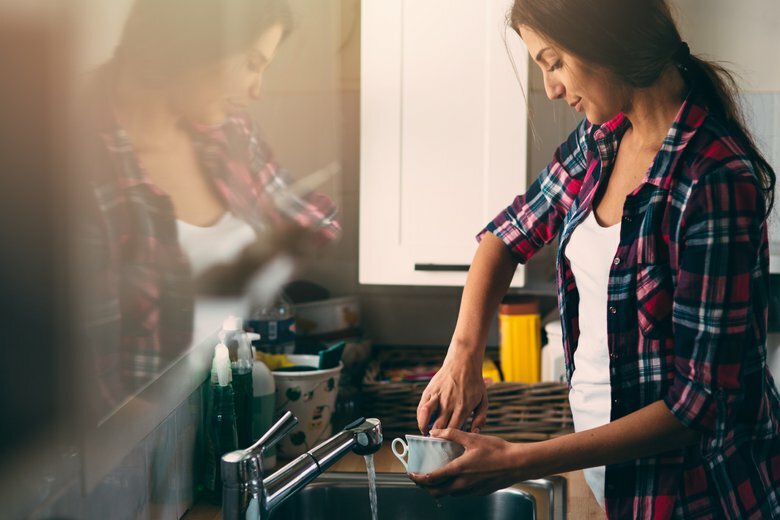 Remember, caregivers are almost always considered household employees, not independent contractors, because you set their schedules, supply them with what they need in the house and hire back-up care. As such, you will be responsible for payroll and proper tax withholding. 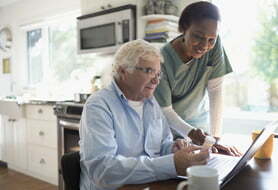 What's Wrong With Hiring My Senior Caregiver as an Independent Contractor? Hopefully, with these tools, you, your loved one and the caregiver will all be able to form a healthy and fruitful working relationship — but of course this isn’t always the case. If you find that you’re struggling with a caregiver who shows up late, spends too much time on their phone or just isn’t providing that level of attention you’d planned for, know that you aren’t stuck; there are workable solutions to these common issues with in-home caregivers or ways to change it up if the person just really isn’t a good fit.